Table Top combines elements of Johnson's earlier paintings with an entirely new method. In this work, the shapes are marked upon the canvas into a horizontal format, and then masked with tape to achieve a hard-edged form. We see an emphasis on schematic, curved forms that recall the Oceania, High Low, the artist's winning painting for the Wynne Prize at the Art Gallery of New South Wales in 2014. 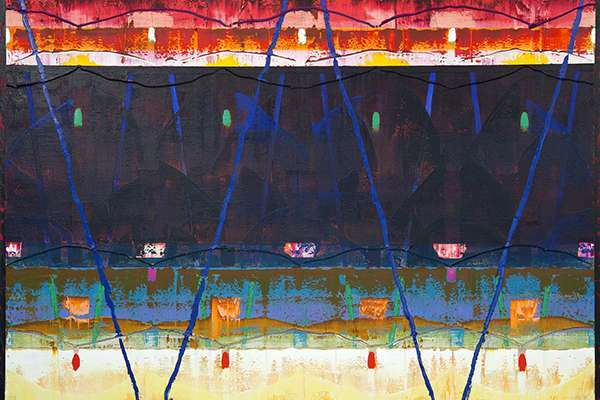 Michael Johnson draws upon his experiences of extraordinary natural phenomena to create lyrical interpretations of colour and space. Forming a visual counterpart to Aurora Borealis, this painting refers to the dramatic colours of the southern lights. In this work, angular lines dance between the horizontal bands in a way that suggests musical notation. Michael Johnson has spent much time immersed in aquatic environments, particularly for the purpose of fishing. In addition, he spends a lot of time looking at nature photography in publications such as National Geographic Magazine. This painting relates to the tuna, and the strikingly individual colourations that happen upon the surface of the skin. 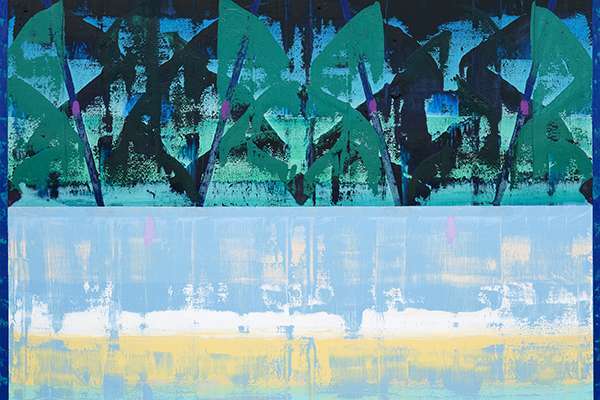 In this way, these paintings might be seen as momentary evocations of the natural world. Michael Johnson grew up surrounded by art; both his parents were painters and there were framed prints of Vermeer and Albert Pinkham Ryder hanging on the walls of his childhood home in Mosman. Leaving school at fourteen he worked at the Lintas agency, rambled around rural NSW on painting trips with close friend Brett Whiteley and studied at the Julian Ashton Art School and the National Art School in Sydney. In 1960, he decided to travel and departed by ship passing through Egypt, Greece and Italy on route to London. He met Whiteley in Florence and together they decided to travel to Bologna to visit the studio of the Italian still life painter Giorgio Morandi. 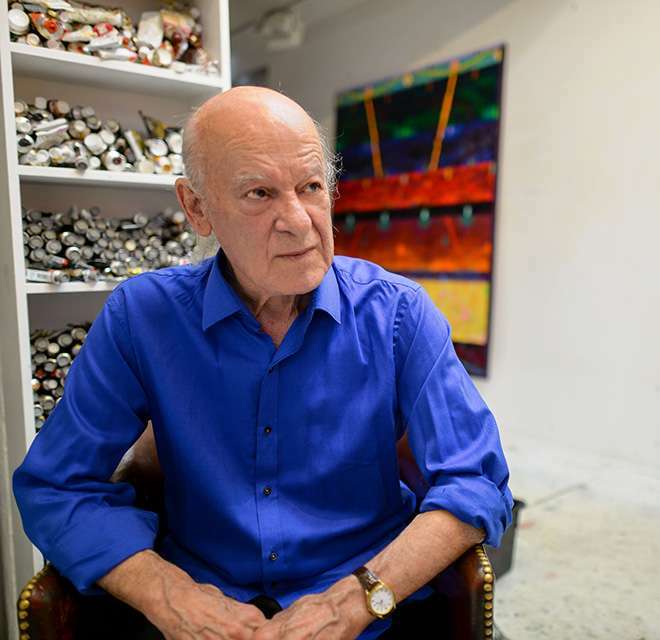 When he eventually arrived in London he spent the next seven years painting full time while also working as a studio assistant to the British sculptors Brian Wall and Anthony Caro. While living in London he immersed himself in the art world and was introduced to Francis Bacon, David Hockney and Oskar Kokoschka. 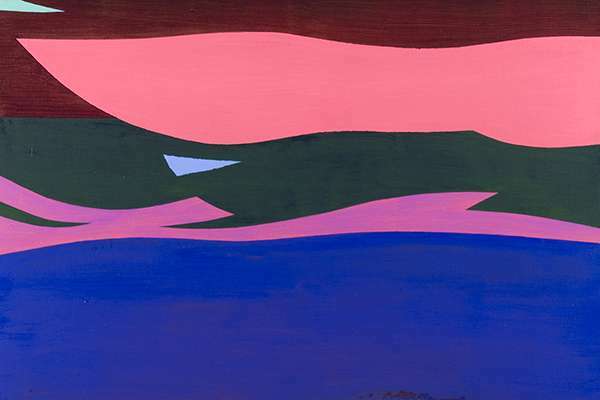 Unlike other Australian artists who found international success through figurative and semi abstracted landscape (notably Sidney Nolan and John Olsen) Johnson's European experience distilled his love of colour, space and form into highly distilled abstract works. His return to Sydney in 1967 contributed to a generational shift towards minimal geometric abstraction that was reflected in his first solo show at Gallery A and the ground breaking exhibition ‘The Field’ in 1968. Mixing his own pigments and stretching his own frames to generate unique shaped canvases, these minimal works were characterized by large areas of flat, solid colour creating unbroken surfaces with no emphasis on gesture or brushstroke. His purpose was to eliminate recognizable imagery in favor of abstraction and to build a unique fusion between architectonics, sculpture and painting. Inspired by the work of Quattrocento Italian painters, the organic forms of Constantin Brancusi, the frontal drama of Albert Albers and the colour and scale of Henri Matisse, his work in the late 60s was a uniquely Australian interpretation of a major global shift away from representation. Moving to New York in 1970, the work of the next decade gradually came to embrace more surface texture and a palette that became more and more identifiable with a ‘bush spectrum’. By the time he reached North Queensland in 1979 he became interested in the diversity and ecology of the environment, looking at the intense and complex relationships within nature. Many things triggered his inspiration: his appreciation of form, the colours on bird feathers, and the reflecting metallic hot-rod colours on beetle wing covers. The symmetrical patterns on butterfly wings, leaves, mammals, reptiles, fish bones and birds eggs, everything was absorbed, remembered and used in his art. Colour and light have remained a lifelong preoccupation and Johnson links every major shift and phase of his work to natural influences: fallen branches on a bush floor, floating leaves on a moving river, and how light from the sun reflected on different water surfaces, especially in the ocean. Many of Johnson's large nocturnal and oceanic blue works evoke a personal memory of staring through the sea water on a dark night and marveling at the phosphorescence and the bioluminescence of the organisms swimming in the sea. 1938. Born in Sydney, Australia. 1953 - 59. Studied at the Julian Ashton Art School, Sydney. Completed Diploma of Art, National Art School, Sydney. 1960 - 67. Lived and worked in London. 1962 - 63. Brian Wall (Steel Sculpture), studio Assistant. 1963- 64. Michael Kidner (built and constructed three-dimensional painting), studio assistant. 1964 - 65. Anthony Caro (rebuilt and painted ‘Madam Pompadour' aluminium), worked with Ron Robertson Swann and repainted all steel works of Anthony Caro, studio assistant. 1989. One year residency at the Ian Joyce Foundation Studio, Sydney. Painting commissioned for the Sydney Conference Centre at Darling Harbour. "Probably the strongest influence that brought about the metaphor of water, darkness and skies was the mystery of fishing at Lobster Beach at Broken Bay"